To Cite: Domonkos Tarnoki A, Laszlo Tarnoki D, Klara Kiss K, Bata P, Karlinger K, et al. Unusual Cortical Bone Features in a Patient with Gorlin-Goltz Syndrome: A Case Report, Iran J Radiol. 2014 ; 11(4):e5316. doi: 10.5812/iranjradiol.5316. Gorlin-Goltz syndrome (GGS) consists of ectodermal and mesodermal abnormalities. In this case report we will investigate lower extremity lesions of GGS. A 52-year-old man with GGS underwent skull and lower extremity computer tomography. Radiographic findings included cervical spondylosis, transparent areas with slurred margins, and cerebral falx calcification. Tibial and fibular specific cortical lesions (thin cortical and subcortical cystic lesions) were seen on the radiography, which was confirmed by computer tomography. To our knowledge, this is the first report of such a long lesion of the tibia and fibula. Specific lower extremity cortical lesions (thin cortical and subcortical cystic lesions) may occur and these abnormalities can be found on radiography or CT, which are most probably attributed to retinoid treatment. Gorlin-Goltz syndrome (GGS) is an infrequent autosomal dominant genetic disorder as a distinct entity consisting of ectodermal and mesodermal abnormalities. The gene for GGS is located on chromosome 9 (9q22.3-9q31) and it has been identified as PTCH (Drosophila segment polarity gene patched), the human homolog of the Drosophila "patched" gene PTC (a tumor suppressor gene) (1). The diagnostic criteria of GGS consist of major and minor criteria depending on the clinical and radiological signs and symptoms. The diagnosis is established if two major criteria or one major and two minor criteria are present (2). The patient is most commonly characterized by a broad face, rib malformations, and an extraordinary predisposition to basal cell carcinoma before the age of 15-30. To our knowledge, long cortical lamellar and cystic remodeling of the lower extremity bones have never been described. A 52-year-old man was seen at our department with the history of GGS. GGS was determined based on the presence of three major criteria (Table 1) (3-5). Therefore, genetic confirmation was not necessary. The first basal cell cancer were seen on the nape of his neck and below his nose at the age of 17 years. Later in his twenties, more tumors appeared on his trunk and face, which reached 2-6 cm in diameter. The tumors were irradiated several times on the patient’s chest, back and nape of the neck. Surgical excisions were performed on his face, chest and back and intralesional interferon alpha 2b was injected. The patient was given isotretinoin and he was treated by photodynamic therapy and liquid nitrogen cryotherapy. Additionally, dental cyst and vertebrobasilar insufficiency were also present in the patient. The laboratory tests (including serum calcium, phosphate and alkaline phosphatase) were normal. At the age of 48 years, a skull X-ray showed transparent areas with blurred margins and calcification of the cerebral falx. The patient underwent radiographs of the skull, hand, thoracic and lumbar spine recently. These radiographies showed the pathological bone characteristics of GGS: marked hyperostosis (cortical thickening) of the skull and calcification of the cerebral falx; and calcification of the anterior longitudinal ligament on the thoracic part. Hand radiography images showed degenerative changes and cystic lesions of hand bones, and distal parts of the ulna and radius. Skull computed tomography (CT) confirmed the cerebral falx and U-shaped tentorial calcifications without parasellar manifestation and brachycephaly. The tibia and fibula radiographs showed thin cortical and subcortical cystic lesions (Figure 1). CT of the femur, tibia and fibula indicated thin cortical bones mainly on the distal parts of the tibia and fibula, cortical lamellar and cystic remodeling, especially on the left tibia and distal part of the femur (Figure 2). Figure 1. A 52-year-old man with Gorlin-Goltz syndrome. Figure 2. Tibia and fibula CT images showing thin cortical bones, cortical lamellar and cystic remodeling in the cortical and spongious compartments. The diagnosis of the patient was established on the presence of bone characteristics and the previous history of multiple basal cell carcinomas. The large number of basal cell carcinomas, the marked hyperostosis (cortical thickening) of the skull, calcification of the cerebral falx and tentorium, cystic lesions of extremity bones confirmed by radiography and CT match the major criteria of GGS (2, 3). Radiology has an important role in the diagnosis and management of the disease in order to make an early diagnosis of serious complications like tumors. Ultrasound scans during pregnancy also play a role in the early detection (4). Most of the bone lesions can be detected by CT scan. Magnetic resonance imaging is useful in the detection of soft tissue manifestations. Skeletal manifestations (including the calcification of the atlanto-occipital ligament) found on the radiography are also present and they are helpful in making the diagnosis (4). Chest, skeletal, skull and abdominal radiographies are useful in the detection of different manifestations of the disease (Table 2) (3). The patient was given isotretinoin, which is a retinoid, a vitamin A derivative. Retinoids have some anti-tumor effects other than their usual role of reducing sebum production. It has been known to cause premature epiphyseal closure in humans as an unwanted side effect of chronic treatment (6) and hyperostotic changes especially on the tibia (7). Risk of bone fractures was not changed with increasing doses or durations of treatment with isotretinoin in a nationwide study (8). In our particular case, the uncommon tibial and fibular osteal changes (cortical lamellar and cystic remodeling) do not show a clear image of a well-defined cyst in any location. Instead, they rather show a ”mouse eaten” like appearance of osteopenic reaction that is most probably due to medication, which the patient had been taking chronically. Therefore, these changes might be rather related to retinoid therapy than the presentation of GGS. Accordingly, these findings are not included in the criteria of GGS. Various skeletal abnormalities such as periosteal thickening, hyperostosis of the vertebral column, disk degeneration, osteoporosis, calcification of the spinal ligaments, and slender long bones were associated with retinoid therapy (9). In contrast, another study has not observed any association between retinoid therapy (chronic hypervitaminosis A) and bone mineral density (5). First-degree relatives should be examined for GGS in order to establish an early diagnosis. Radiographic examination protocol should include a skull radiography (large head, frontal and temporal bossing, and cleft palate) and chest radiography as well (bifid ribs and vertebral anomalies). Calcification of ovarian fibromas is also characteristic. Sometimes, if the major criteria such as basal cell carcinomas, jaw cysts, or cerebral falx calcification are absent until the teen years, other radiological manifestations of the disorder can permit early diagnosis in childhood (4). Patients suffering from GGS are recommended to undergo follow-up examinations in order to avoid the associated malignant tumors and other related pathologies (Table 2). However, the carcinogenic effect of radiation exposure must be taken into account. In conclusion, radiography is a useful method for detecting the characteristic findings of GGS. 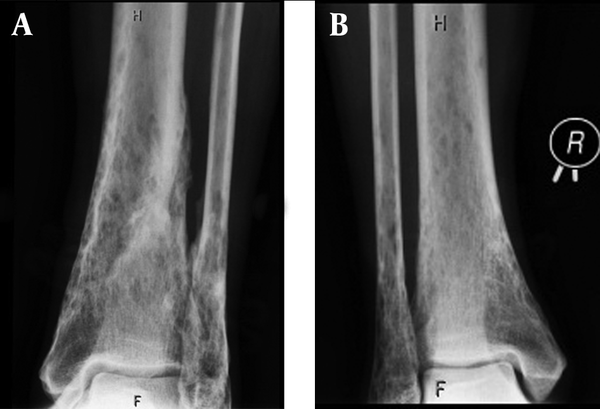 Specific cortical bone lesions of the lower extremity (thin cortical and subcortical cystic lesions) may occur and these abnormalities can be detected by plain radiography or CT, which may rather be attributed to retinoid treatment than GGS. We would like to thank the assistants of our clinic for their assistance.